As film and media historians in their own right, it is significant that Lewis and Smoodin have looked to—and continue to look to—the work of their academic peers, as well as the work of film critics. (Among others, this anthology features the work of Molly Haskell and Robin Wood.) What emerges in this carefully curated collection is a sense of the microhistories of American cinema that have been written over the past forty years. Much of the scholarship presented in The American Film History Reader was made possible by the wealth of primary source materials that has surfaced since the 1970s—in both public and private archives and collections—and allowed scholars to bridge the history/theory divide that was beginning to entrench itself in the discipline as early as the 1960s. The American Film History Reader demonstrates that such boundaries are mutable, allowing for new voices to emerge and for new histories to be written. The notion that the historical records contain gaps that need to be filled had become a standard premise of film historiography. It was misleading to suggest that simply by identifying such gaps, historians could gain unfettered access to the past. Much as moving images are inherently reproducible, moving image histories can also multiply: generating, rather than simply filling in, modes of historical inquiry. Some of the texts in this book may be familiar to FQ readers, as several of the authors cite scholarship from FQ in their arguments and others originally appeared in these pages. Notably, Barry Salt’s “Film Style and Technology in the Thirties” (featured in Part II: Technology) exemplifies Lewis and Smoodin’s model of key texts by film historians engaged in detailed studies of the technological advancements at particular moments in the film industry that linked their informed observations with their analyses of film style.3 These did not comprise merely a “form follows function” type of argument, but something more revelatory for the evolving discipline of film studies. Lewis and Smoodin remind the reader that style matters, not simply in terms of recognizing and appreciating particular films and their aesthetic triumphs, but equally so in the writing of film histories. Similarly, Lea Jacobs (Part V: Censorship and Regulation) and Anna Everett (Part III: Reception) are exemplary for their ability to examine more complicated networks of commercial film production, distribution, and reception. Such research models have become increasingly more useful, assisting film historians in moving between their stock-in-trade of formal, deep textual analysis at the level of individual cultural productions and more lateral comparative cultural analyses that can rethink the limits of the networks of production, across or between regions, nations, and cultures. The case study structure allows historians to zero in on films as objects, ideas, historical narratives, and institutional constructs: interrogating questions of ownership, access, and authorship in their literal and metaphorical senses. These questions had been asked for some time by historians of art and printed culture, but in the field of moving images there seemed to be a resistance to engage more directly with these ideas, as if the appeal of the image—documentary or fictional—were too strong to be relegated to the background of the analysis. If there are individuals who cling stubbornly to the notion that an Ivory Tower still exists in academia, Eric Smoodin and Jon Lewis are certainly not among them. 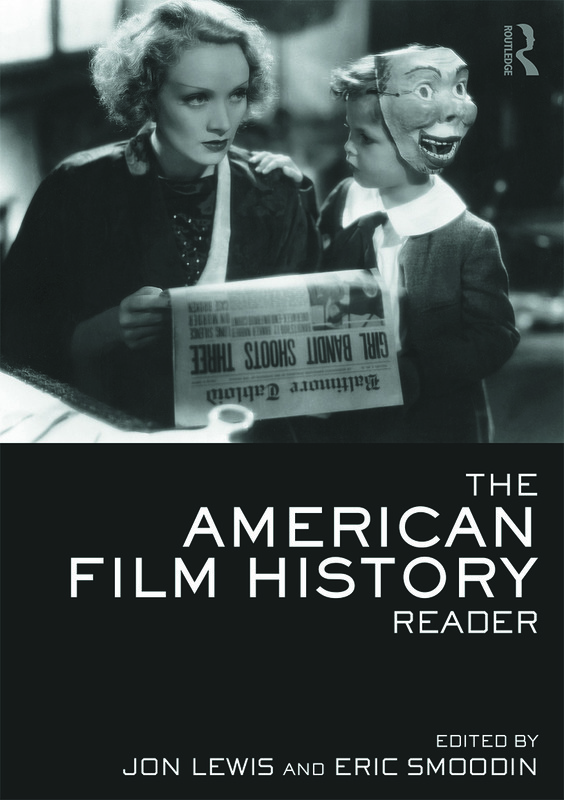 The publication of The American Film History Reader is a testament to their belief that there has always been more than one film history to write, and more than one method to writing it. And, just as important, it is confirmation of their collaborative approaches to scholarship and pedagogy. Longo: This book marks your second collaboration on an anthology devoted to American film history. It’s been ten years since your first, Looking Past the Screen: Case Studies in Film History and Method (Duke University Press, 2004). Did this project evolve organically from that first endeavor? Smoodin and Lewis: The first book—Looking Past the Screen: Case Studies in Film History and Method—came out of a Society for Cinema and Media Studies (SCMS) panel we did focusing on cinema histories that did not consider a film or body of films as the primary text(s). The original title of the book, a title we still like a lot, was In the Absence of Films…Case Studies in Film History and Method. It was apt because the essays in that book focused on documents or texts or evidence other than the film or films up there on screen (hence the revised title: Looking Past the Screen). In 2004 we did not have a sequel in mind, but thinking about them [the two books] together, we did want to showcase original work by film historians who used “the archives,” so to speak, in creative ways in both. At bottom, both books take folks interested in film history away from the “great films/great directors” model. So yes, the new book, Film History Reader, is a logical next step, anthology-wise, in that it again surveys a range of American film histories and historiographies and organizes the material thematically (as opposed to chronologically). And it collects work that in our view approaches American film history in different and illuminating ways. Longo: You have both had prolific careers as academics, historians, editors, authors, and—to a certain degree—as cultural critics. In this anthology, there is a singular, yet nuanced, voice that emerges in your introductory essays and in the selection of materials featured. When and how did your professional collaborations begin? And how do you manage to mesh your distinct authorial voices in such a seamless and productive way? Lewis and Smoodin: Though it was not exactly a “professional collaboration,” because we were not professors or publishing writers quite yet, we both began the doctoral program in Film and Television Studies at UCLA the same year, in 1979. As is true for a lot of us when we were in graduate school, the excitement we felt came as much from the cohort of students as from the faculty, and so we were always talking to each other— for us, to colleagues like Richard deCordova, Lea Jacobs, Steve Ricci, Geoff Gilmore, Fabrice Ziolkowski, Janet Walker, Frank Tomasulo, Michael Friend, and Greg Lukow—about scholarship, about film history, about research methodologies. One of the really great things about being at UCLA was that we couldn’t help but become aware that film studies had a compelling history that most people didn’t know that much about. We got to work with and learn from other students who had started grad school a few years before us, people like Janet Bergstrom and Michael Renov, or a few years before that, like Bill Nichols, and of course from faculty who had founded the graduate program, and so we couldn’t help but develop a sense of the generations and genealogies of film history, and different and overlapping methodologies. And then there was the UCLA archive, the opportunity to screen pristine 35mm prints for our classes and to do hands-on research on what now seems like pretty old-school equipment with actual film prints. With our current volume, we’re not so much interested in stating a case for specific methodologies as we were in the previous collection, but more in figuring out what methodologies have been available and useful over time, and how different scholars have employed them. If we do have a consistent voice in The American Film History Reader, it probably comes from a shared curiosity about the history of film studies, the sort of thing that Dana Polan, Lee Grieveson, and Haidee Wasson write about, and by trying to write from our experience as teachers as well as scholars. That is, how might we explain to people, with varying degrees of expertise, precisely how our field has developed? Longo: It is encouraging that AFHR takes your thinking in a new direction, turning the focus back to the films themselves, while also staying attuned to historiographic practices that are deeply engaged with the study of industrial practices, media technologies, reception studies, auteur theory, censorship and regulation studies, and stardom (and fan culture). Quite rightly, you note that instead of choosing the most canonical texts in each of these areas, you have chosen texts to demonstrate how the profession is developing in each of these areas. Can you explain a bit more about this process of selection? Lewis and Smoodin: When you’re putting together a collection like this one, the work can be as much bureaucratic and organizational as it is intellectual. Our publisher gave us a generous—but of course not unlimited—permissions budget and, by extension, not unlimited space. So we had to think very carefully about categories and selections. We had to give up articles and sections that dealt with the American avant-garde, documentary, and animation, for instance. [We] decided that, given the number of pages we had to work with, a precise focus on historiographies of narrative, live-action, more-or-less major studio produced films would work best. But that really didn’t help the selection process that much. How could we not, for example, include Tom Gunning’s essay on the “cinema of attractions”? It’s such an important essay. But it’s been anthologized so often [that] we finally left it out. We also wanted students to be aware not only about how film history has been written but also about the different voices responsible for it. It’s far too easy to round up the usual suspects and publish articles by the same bunch of white guys. Film studies has been somewhat more democratic than other disciplines, and to reflect that, we wanted to present a diverse group of historians, who themselves might not always have been scholars or academics in the sense that we understand those terms today. In other words, we think it makes sense to understand US film history in such a way that the work of Molly Haskell and Miriam Hansen can appear in the same volume, because of the ways that film history was practiced in the 1960s and 1970s, and the ways it’s practiced now. Longo: The start of each chapter in AFHR presents a short introduction, a summation of the historiographic turn, which it highlights, and a list of suggested further readings. Your introduction to the book states that some of the suggested readings could have just as easily been chosen to represent the category had the chapters not been limited to only three articles per chapter. What were the distinguishing criteria that allowed for the final choices to be made? Smoodin and Lewis: The selection process wasn’t easy! And even when, in the introductions and in the suggestions for further reading, we added in citations and recommendations for follow-up, we know that we still left out work that has proven to be important and influential … essays we admire. We were limited by the Reader format, by practical things like permissions costs, and by how much of a doorstop book we thought we should publish. Six chapters with three essays apiece in the end allowed us to collect some excellent film historical work and not overwhelm potential readers…. Again, we were not trying to insist upon a canon which would necessitate a doorstop book, but instead … to showcase a range of historical research and writing and set the stage for further reading (which we suggest) and study. Longo: The selected and suggested readings reflected the genealogy of the six historiographic approaches addressed in this book. Instead of focusing simply on the beginnings or heyday of a movement or practice, you demonstrate its staying power. Can you address the reason for publishing this anthology now? What do you see as its importance for the evolving field of film and media studies? Lewis and Smoodin: It is difficult at this stage to talk about “importance,” and much as we’d like to see this anthology adopted and discussed in film studies classes in the future, we’d instead like to suggest a couple of overlapping issues that point to the importance of reading through film history in the manner indicated in our book. First, film history itself has a history, and it’s one that stretches back a long way in the United States and elsewhere. Second, we always have to speak of “film histories” in the plural, rather than just “film history.” There’s no one genealogy of cinema. Instead, there are many, often practiced by the same people and often having lots of things in common with each other—but sometimes not. We’re also among a number of people in the field who oppose the binary opposition of history and theory. That binary seemed to be very much in effect, for instance, when we were in graduate school in the 1970s and 1980s. Over the last thirty years or so, though, more and more scholars have tried to break down that divide, in order to theorize film history and historicize film theory. We hope that The American Film History Reader contributes to that effort. Longo: Inevitably, the only “negative” critique launched at LPTS may also be launched at AFHR: the focus of the anthology is (mainly) American. Undoubtedly, you have anticipated this critique, so what do you say to those who question the American-centric focus of your anthology? And, which of the six chapters do you think might be most successfully adapted to global media historiographies? Lewis and Smoodin: The quick answer here is that we’re both primarily American film historians … we’re really aware of our roles and responsibilities as editors and as curators or presenters of work in this field. We feel comfortable speaking to and writing about and showcasing this work because we’re American film historians. American film history is hardly a narrow field of study and the body of work is considerable. There is room of course for a European Film History Reader … a Japanese Film History Reader, etc. And we can imagine such volumes forthcoming from Routledge’s Film Reader series. Longo: In another ten years, will there be a third anthology? Can you imagine now what it might look like? Smoodin and Lewis: In ten years, it’s safe to say, we will both be retired, perhaps basking on beaches somewhere. Assuming we decide to put our daiquiris down, then another volume might make sense. We can imagine similar categories and a similar historical scope. In just one example, though, of all of the categories that influence historical writing, we can only begin to imagine how our understanding of film history will be affected by all the new technologies—in terms of production, but also in terms of exhibition, film journalism, and so many other things connected to cinema. Then again, in ten years we might not be the best people to produce that volume. Both of us have a very traditional film studies training, and so it might be best for younger scholars to update the history of the field. We’re not even sure that, in ten years, “film” will be the best descriptive word to use in the title of a volume like this one. We hope, though, that our book, along with other recent and terrific historiographic work, can serve as something of a model for asking questions and refining methodologies. We certainly don’t mean this to be the last word on film history. Instead, it’s an invitation for film scholars to imagine multiple histories and different practices, and to apply them to different modes of production and varied national—and transnational—settings. 1. Full disclosure: I was a student of Professor Smoodin on the UC Berkeley campus as an undergraduate and therefore have a somewhat special interest in following his pedagogical interventions. 2. Note that FQ readers can view and download their Introduction in its entirety on filmquarterly.org’s Page Views section. 3. See Barry Salt, “Film Style and Technology in the Thirties,” Film Quarterly 30, no. 1 (Autumn 1976): 19–32.